Monte Carlo + Redneck Riviera + Drunk 11-Year-Old Driving + Embedded Beer Ad = White Trash Wednesday! IAMI (Reuters) - An 11-year-old girl was charged with drunken driving after leading police on a chase at speeds of up to 100 mph that ended when she flipped the car in an Alabama beach town. A video camera in the police car captured the look of surprise on the officer's face when he approached the wrecked car and got a look at the motorist. That there's just reg'lar funny (and don't give me no guff. Nobody got hurt - it's funny). 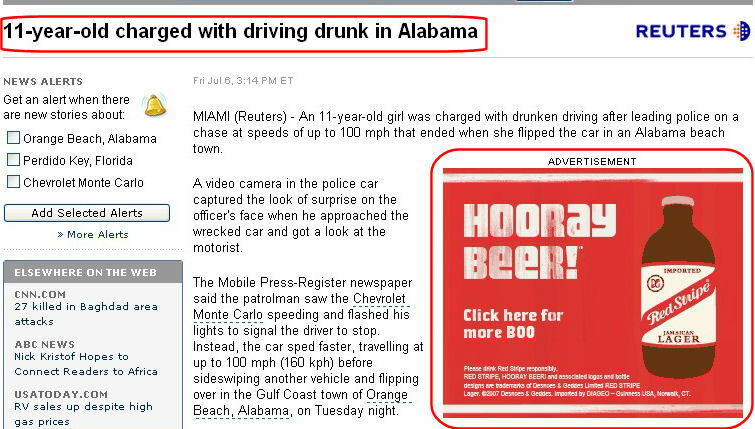 I think whoever does ad serving for Reuters needs to rethink their algorithms - it's probably not a great idea to put a beer ad in an article that contains the words "drunken driving." Bob & Tom often employ a kind of forbidden-joke shorthand. They regularly throw out punchlines that aren't themselves dirty, but, if combined with the rest of the corresponding joke, would bring the FCC down on them like the Hand Of God (or at least the Hand Of God-Botherers). For the whole joke behind "Where do you think they held the auction?" go here. For "Hey, lady, your sign fell down," go here. No charge. Just another public service I'm happy to provide. You've heard of the expression "Don't piss on my leg and tell me it's raining?" How about "Don't piss in my ear and tell me I've got an infection?" Listen to this clip from hour 1 of last Tuesday's Bob & Tom. Amanda Lynn Bailey couldn't have picked a more appropriate shirt for her arrest on DUI charges. The 41-year-old is a dealer for the Seminole Hard Rock Hotel & Casino in Tampa. She was arrested July 31 and charged with driving under the influence and driving with a cancelled, suspended or revoked license. It was her second DUI arrest in three months.